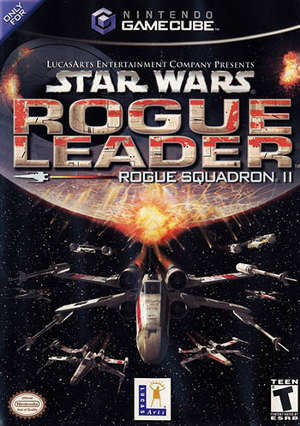 Star Wars Rogue Squadron II: Rogue Leader is an arcade-style flight action game co-developed by Factor 5 and LucasArts. The second of three games in the Rogue Squadron series, it was published by LucasArts and released as a launch title for the Nintendo GameCube. The game was praised for its amazing visuals, thanks to an impressive game engine that uses advanced GameCube features. Similar to its predecessor, Star Wars: Rogue Squadron, Rogue Leader is a fast-paced, flight action game. Each of the game's ten levels introduces mission objectives such as search and destroy or protection that must be completed to progress to the next level. The players performance on each level is compared to three medals (bronze, silver, and gold), based on completion time, enemies killed, etc. Getting more medals results in unlocking more levels and spacecraft. Rogue Leader also has a large collection of hidden items throughout the game, from powerups, hidden ships, and hidden levels. Because of its technical prowess, use of rare GameCube features, and plethora of hacks, Star Wars Rogue Squadron II: Rogue Leader has proven difficult for Dolphin to emulate. Star Wars Rogue Squadron II: Rogue Leader is one of the most susceptible titles to shader compilation stuttering. The GC and Wii have no concept of shaders - everything is executed directly by the hardware without an intermediate programming language (API). Modern computers and mobile systems do not work in this way, requiring the use of shaders as an intermediary so your system's GPU can perform the tasks that the GC and Wii GPU performed directly. Shaders have to be generated though, and since GC/Wii games are not designed to create shaders ahead of time as a PC game would, when a new effect appears Dolphin has to delay the CPU thread while the GPU thread performs the compilation; a pause that does not exist on the consoles. For most games shader generation takes only a few milliseconds, but for a few demanding titles, the shaders that they generate are so large that they can result in noticeable stuttering, in severe cases pauses of over a second may occur. Leaving GPU Texture Decode enabled will cause Rouge Squadron II to crash on a fairly regular basis. Using the targeting computer or pressing Start to bring up the menu can occasionally both result in a hang. Fixed by 4.0-4889, but broken again by 4.0-5971. This hang cannot be avoided by disabling dual core, contrary to what is stated in the official ticket: issue 8493. Music is garbled and distorted with DSP-HLE. Use DSP-LLE to rectify this, or disable music in the game's options as a workaround. Refer issue 7228. There is a high definition texture pack for Rogue Leader on the Dolphin forums. The Widescreen Hack has Clipping and Scaling issues that can be fixed with a Gecko Code. The graph below charts the compatibility with Star Wars Rogue Squadron II: Rogue Leader since Dolphin's 2.0 release, listing revisions only where a compatibility change occurred. 3.0 Windows 7 AMD Phenom II X6 1090T @ 3.8GHz ATI Radeon HD 4870 Wonky sound, parts runs weird/bad. Lots of framerate issues and the game doesn't render much in front of you. r7687 Windows 7 AMD Phenom II X6 1090T ATI Radeon HD 5770 Non-stop "Trying to reinterpret pixel data with unsupported conversion type 1 and 4" errors when starting. 4.0-3810 Windows 7 Intel Core i7-2760QM AMD Radeon HD 6990M Running with EFB to RAM external frame buffer to Virtual, audio works perfectly with LLE but the game runs slow. Need to optimize the settings, however as indicated earlier the drawing distance is too low which makes the game unplayable. 5.0 Windows 10 Intel Core i5-3470 NVIDIA GeForce GTX 650 Ti Occasional short stutters during cutscenes. Constant 60FPS on space levels. Battle of Hoth and Prisons of the Maw are slightly laggy. Otherwise playable. MISSINGNO. 5.0-1615 Windows 10 Intel Core i5-3470 NVIDIA GeForce GTX 970 Occasional stutters disappear as a shader cache is built up. Constant 60 FPS on all stages and cutscenes at 4K. Setting XFB to Virtual fixes the twitchy pause and mission complete screens. Runs Perfectly. MISSINGNO. This page was last edited on 24 May 2018, at 09:41.